It is the norm to build new schools on their existing site and Wardle Academy in Rochdale has recently successfully done just that. In fact OVER 80% of the Government school rebuild programme happens on existing school sites. We could do the same, just as successfully. 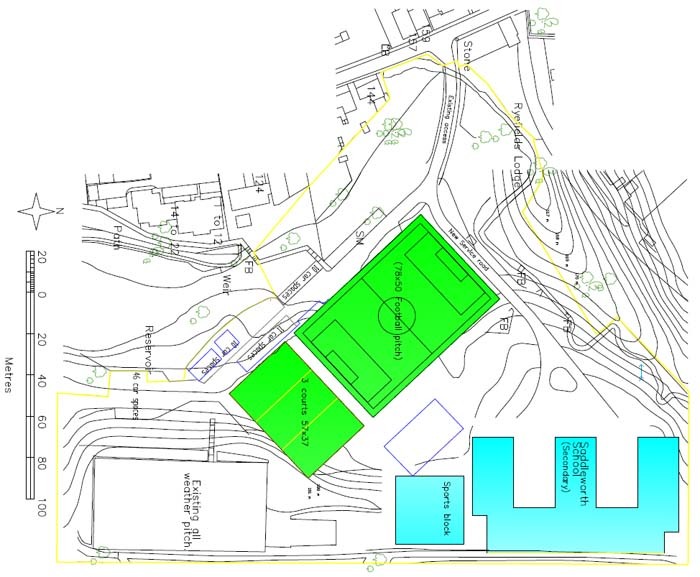 Plans showing how the current Education Funding Authority (EFA) design proposals for the Diggle site will fit on the mostly unusable football pitch on the current Uppermill site are now being considered by OMBC and the EFA. Save Diggle Action Group (SDAG) believes that the proposal to choose Diggle over Uppermill may have been based on the old BSF (Building Schools for the Future) design from 2008 rather than the new EFA design, and that it has not been reconsidered in the light of revised funding arrangements. The attached proposals, loosely costed by a professional developer are identical in size and form and offer equivalent and in some parts better facilities to those proposed at Diggle. The school has been involved in aspects of the design and their requirements incorporated into the plans. The new plan recognises that the all-weather pitch and outdoor courts in Uppermill can be retained. Further savings may be made by refurbishing the existing sports hall (as has been done at Oldham academy North), as opposed to the larger cost of new facilities in Diggle. In order to avoid excessive costs for contractor access, which was seen as a major problem with the Uppermill site, the new proposals involve a much cheaper route being taken which can be achieved by the temporary relocation of about 6 classrooms elsewhere on site. There will be no other disruption during construction. Most schools elsewhere in the country are rebuilt on existing sites, and the EFA fully supports this approach. Cllr Mike Buckley of SDAG said "the plans have been professionally drawn up and costed. We are confident that with all the potential extra expense involved in building the school in Diggle, rather than using the existing infrastructure in Uppermill, our proposals will be less costly. A brand new, fit for purpose school, can be built in Uppermill, at the heart of Saddleworth entirely within the proposed budget of �17 million if the political and local will exists to achieve this." At the Special Meeting of the Saddleworth Parish Council on the 11th November 2013, it was decided that the following proposed scheme for the rebuilding of Saddleworth School on the existing site in Uppermill would be discussed with Oldham Council and the School. Here are the letters that the Saddleworth Parish Council are sending to Councillor Jim McMahon, Leader of Oldham Council, Matthew Milburn, Head Teacher of Saddleworth School and Debbie Abrahams MP on the matter. Area of the existing school site is 11.5 acres, including everything, 8.75 acres is usable � this includes the playing fields and bus turnaround. The usable area of the proposed Diggle site is 7.75 acres, including playing fields and bus turnaround. 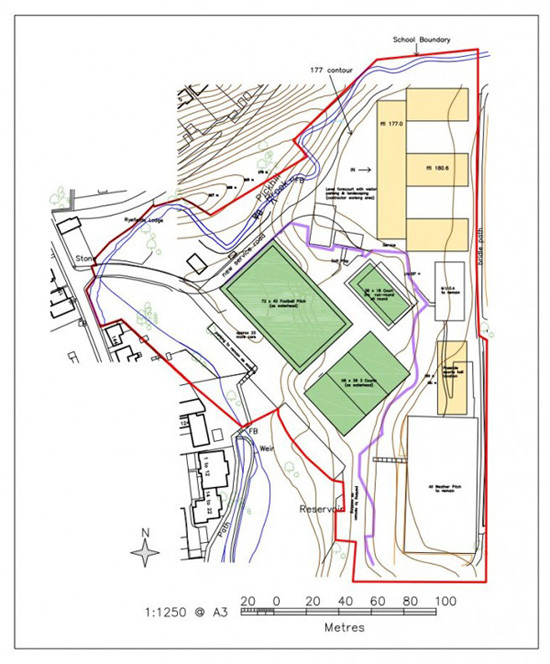 For comparison the area of the Waterhead Academy, including playing fields is 6.47 acres. So in principle the existing site is plenty big enough to accommodate the new school. The Proposal is to site the new school at the rear of the site. If the school is built on two levels (two storey at the rear and three storey at the front) as is proposed at Diggle, the site can be used without any alteration to existing levels (Plan 1). Temporary Accommodation ~ �140,000, but in reality could be less. The cost for lowering the site to the 178m contour and constructing the new road is ~ �200,000. The cost of demolition of the school after construction of the new one is ~ �150,000. Possible retaining wall at the rear of the site ~ �80,000, this would be less if gabbions were used. The proposal above is workable scheme. However more detailed information about the site and the operational needs of the school is required to produce a detailed plan. The proposed scheme has been done on the basis of OS plans, as we haven't been given any drawings of the school, or seen the business plan. With more information a better operational solution and one that has been more accurately costed can be achieved.